I’ve somehow managed to work fulltime online since 2003. In the majority of that time, I have made most mon-ey by creating websites and selling them. So I always look at trends and study closely which sites are popular and selling for good amounts. Then I create sites following those trends and sell them. It’s probably just that which has allowed me the freedom I’ve had for the last 9 years. It took 3 attempts for the owner to sell it on Flippa as buyers backed out the first 2 times. I sent the owner Chris a few messages whilst it was on auction to ask about how he creates his content. And I just couldn’t believe his reply and how easy it was to manage. He simply signed up to RSS feeds and used a popular reader to get the latest news. Then re-wrote some of them and posted them to the site. Sometimes he just wrote a sentence and then pasted in the rest directly from the feed. Well apart from selling it for $200,000 it was earning him on average $6500 a month for just a few hours work a day. It was almost getting 1 million unique visitors a month too. All from re-purposing freely available content! 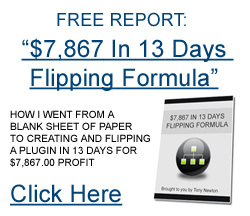 This method is being used by some of the biggest blogs and websites online. We’re talking multi-million dollar businesses. It’s commonly known as content curation and one of the easiest and fastest ways of getting related content and using it in a way the search engines and visitors love. There’s also a daily action plan it comes with too, just 30 minutes a day to complete.